Totally Rad, known in Japan as Magic John (マジック・ジョン? ), is an action-adventure game published and developed by Jaleco, and was released for the Nintendo Entertainment System in 1991. 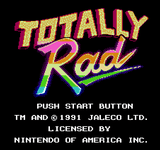 Source: Wikipedia, "Totally Rad", available under the CC-BY-SA License.